(60) Christmas wonder, a photo by The Bacher Family on Flickr. This is another one of those cases of being in just the right place at just the right time. 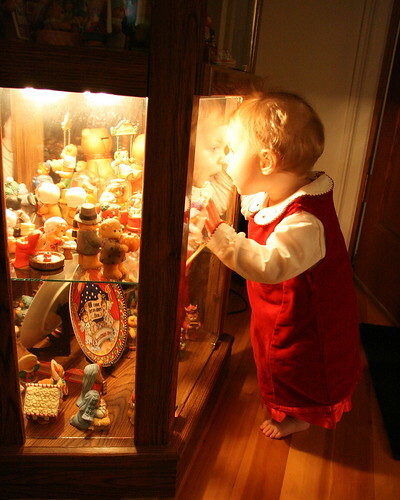 We were gathered for Christmas dinner and I had my camera in hand, when I looked over and saw Aubrey gazing into the display case. A flash would have ruined both the lighting and the mood, so I snapped a shot at slow shutter speed and hoped for the best. It came out even better than I'd hoped. I love the reflection in the glass!